This lock has been used with great success in competition. It can be done in various positions but I will describe the most usual position. Quite often in groundwork your opponent will end up in the defensive posture as shown with you kneeling close behind him. 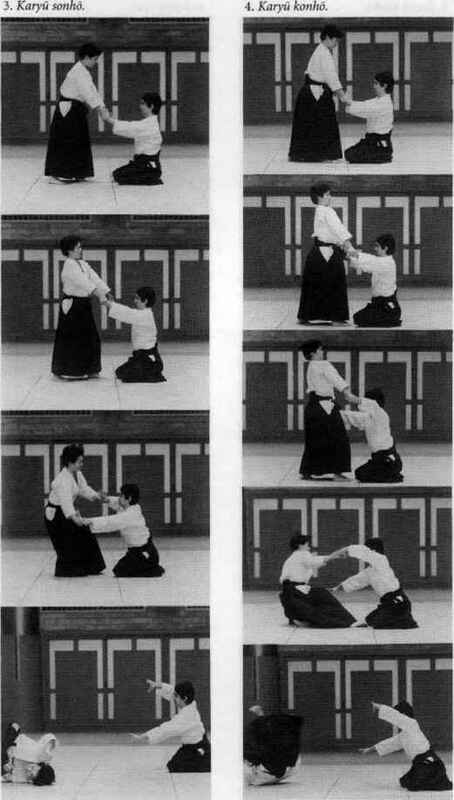 To apply the lock, first of all place your left thigh on your opponent's head, at the same time making your right hand into a ball, push it under the opponent's right arm and then catch your own left arm. Now swing your left leg over his head and tuck your heel into his neck on the left side. Your right leg bends with the right foot tucked in under the opponent's body. At the same time as you swing your left leg over the opponent's head, start to fall back with the opponent's arm trapped in between your legs. Keeping his arm trapped between your legs start to put on the pressure by raising your hips off the ground. Carefully transfer your grip to his wrist and in combination with the raising of the hips pull his arm against the action of the joint until he submits. To get the right pull against the joint always pull in the direction of the little finger (the opponent's). Make sure that you trap the opponent's arm tightly between your two legs. Note the exact position of my legs in the plates.